Peter Hessler, staff writer at The New Yorker and its Beijing correspondent from 2000 to 2007, has become one of the most popular and fascinating documentarians of the vast economic and cultural changes that have come to China in recent years. His bestselling books River Town and Oracle Bones are now followed by the third in the trilogy. 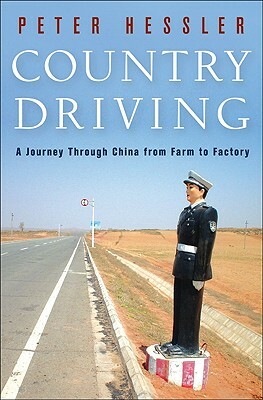 In Country Driving, Hessler talks about finally acquiring a Chinese driver’s license in 2001 (one of 1,000 new drivers now registering every day in China) and spending the next seven years traveling around the country, chronicling China’s economic revolution and the changes it has wrought in the lives of ordinary people through fascinating anecdotes, personal stories, and statistics. Driving is a new thing for many Chinese, and Hessler amusingly remarks on the eccentric habits of Chinese drivers and the sometimes whimsical ways in which the streets, many of recent vintage, have been laid out. Mandatory driving instruction classes ignore issues like turn signals and blind spots in favor of the skills needed to negotiate a plank bridge (and apparently learning to honk at anything and everything). His trip leads Hessler into a number of interesting digressions. Maps, for instance – some of the earliest maps in existence are Chinese, on silk and dating from the second century BCE. Chinese cartographic skills devolved over the centuries, however, partly because their maps were military ones of the relatively featureless steppes to the north, the direction of the threat from Mongolia. More detailed maps tended to be made by China’s trade partners, such as those created by the Portuguese around the fifteenth century. After he completed his drive, Hessler bought a home in Sancha, a tiny village about two hours north of Beijing. In Book 2 of Country Driving, “The Village,” Hessler follows the family of farmer Wei Ziqi. Their land provides a microcosm of the changes in Chinese society – the Weis owned little land until Mao Zedong and the founding of the People’s Republic, when the land was taken from large holders and given to the people that actually farmed it. Then that same land was formed into communes and taken back from its owners in the Great Leap Forward of the late 1950s. A terrible famine and millions of deaths were the results. Not until 1978 and Deng Xiaoping did this morph into the so-called “Household Responsibility System,” where the land was really owned by the government but contracted to individual farmers who could again profit from it. Wei Ziqi decided to turn his home into a restaurant at an auspicious time, just as huge amounts of roadway were being built and car sales were growing dramatically. Hessler broadly characterizes the changes he saw in Sancha as Wei’s business grew: 2003 was the Year of the Car (a huge boom in auto sales), 2004 the Year of Construction (of roads in particular), and 2006 the Year of Garbage (with greater prosperity came more waste, and for the first time in Wei’s village, regular garbage pickups). The consequences of the Wei family’s increasing prosperity were many – more money, a larger home, and nicer things, but also poorer health, a greater reliance on fast food, a fascination with the now-ubiquitous television, greater stress, and increasing friction between family members. Another interesting digression involves cigarettes. Hundreds of varieties are available in China, and they’re used to communicate and establish relationships in social and business contexts. Certain brands have particular prestige, and the timing of an offer of a cigarette, or the refusal of one, can convey much. Wei Ziqi took smoking up as an adult specifically for business purposes, the health risks outweighed by the potential financial benefit. As described in Book 3, “The Factory,” in 2005 Hessler moved south in order to explore the other end of the worker’s migratory path – the new, growing cities. One of the overarching themes of Country Driving is the huge movement of people from the north of the country to the southeast, abandoning farms and rural life and seeking jobs in the cities, many brand new, of the south and east coasts. The move for many is a necessity: more than a quarter of China’s land suffers from desertification (especially in the north), affecting some four hundred million people, and more with every year. And the economic opportunities elsewhere are too great to ignore. Many smaller villages find themselves largely peopled by the very old, very young, and disabled – everyone else has left to find work – and Hessler wonders just how long those villages can survive. Hessler’s focus in “The Factory” is southern Zhejiang Province (the most prosperous of China’s provinces), specifically the Jinliwen Expressway, being built from Wenzhou and running north and west. In that area are cities focused on manufacturing and selling specific goods. Hessler cites some remarkable statistics found along the path of old Highway 330, the one being replaced by the Jinliwen Expressway: the city of Xiaxie makes half of China’s playground equipment, Qiaotou over 70% of China’s buttons for clothes, Yiwu a quarter of the world’s plastic straws, Wuyi half of China’s playing cards, Datang a third of the socks used on Earth, and Shengzhou 40% of the world’s neckties. Wenzhou was the hub of all this activity, providing a model for the region – as Hessler describes it, “low investment, low-quality products, low profit margins.” But the strategy works. Wenzhou itself produces 70% of the world’s cigarette lighters and 25% of China’s shoes. This amazing level of industrial activity requires workers, and China has them. Of the nation’s 1.3 billion people, 72% are of working age (between sixteen and sixty-four), and the migrant worker population is growing by 10 million a year. As recently as the 1990s, most employment was assigned by the government. So the whole notion of job searching and recruitment is rather new. But now, away from home and with little personal life, many of these migrant workers jump at the chance to work overtime, seven days a week, with few or no vacations. Many manufacturers prefer their workers to be young, female, inexperienced, and poorly educated – they are more malleable, and work harder for less pay. “This was China’s version of the Industrial Revolution: rural people were moving to cities, and they had a gift for self-invention that rivaled anything in Dickens. And they practiced a no-holds-barred version of capitalism that would be recognizable to any American historian.” There’s one big difference, though: boom towns in America tended to include newspapers, religion, lawyers, police, and the expected facets of city life, whereas in China it is strictly business, with very few other institutions to be found. Little entertainment exists for the workers. Hessler mentions the performing companies that would come to the factories – an evolution, it would seem, of the troupe depicted in Jia Zhangke’s great film Platform (2000) – in which singers, dancers, acrobats, comedians, and strippers would perform on the back of a customized truck. Of extremely variable quality, and frequently illegal, these troupes could make a passable living traveling, via all the new highways being built, and setting up their tents and trucks in one manufacturing area after another. Hessler wonders how these cities can afford all the infrastructure improvements with what seems to be an insufficient tax base and little help from the central government. Rural land, owned not by individuals but by collectives like townships, is acquired cheaply and easily, then developed. Its status now changed to urban, use rights can be sold to the highest bidder – as Hessler sums it up, “prepare infrastructure, sell land-use rights at cut rates to factory owners, and grant tax breaks for initial years of production.” All these transactions are lubricated by guanxi, the semi-institutionalized bribery without which business can’t be done in China. Cities in attractive coastal regions can bring in as much as half of their revenue from such transactions. Hessler recounts one case where land was purchased from farmers for $1 million, developed, then the development rights sold three years later for $37 million. But for this to remain lucrative, cities have to expand constantly. It’s a very speculative system, and eventually China will probably have to privatize land and tax it more systematically. Of course, farmers are among those hurt by this system, making it even more likely that they will join the other millions of migrants to seek work in the cities.